Bran Castle is one of the most popular and interesting tourist attractions in Romania. The main reason for this is that Bran is also known as Dracula's Castle, and the action in the book of Dracula by Bram Stoker is also evolving in the Bran fortress. This Romanian national monument is situated on a hill to the town of Bran near Brasov and is lying on the border between the Romanian provinces of Wallachia and Transylvania. 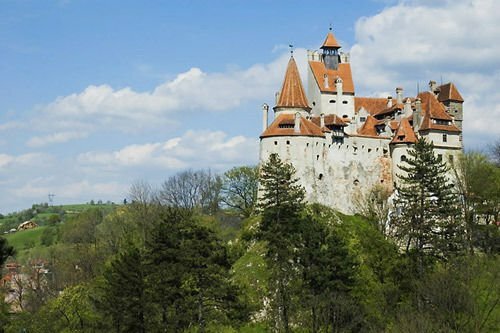 The legendary stories about Bran Castle associate it as the main stronghold of the ruler of Wallachia - Vlad Tepes or as we know him - Count Dracula. Although Vlad the Impaler never lived permanently in the castle he is believed to had been locked for several days in the basement during the Ottoman rule in the territories of Transylvania. The first building on the site of today's Bran Castle was built in 1212, when the knights of the Teutonic Knights built a blockhouse named Dietrichstein. The castle was needed to control the way through the mountain valley of southern Transylvania, used by many traders for faster crossing the Transylvanian Alps. The first written record of Bran castle is a document from November 19th, 1377, by which the Hungarian King Louis I gave permission for the Saxons of Brasov to build a fortress of stone to replace the wooden building. Soon the town was growing around Bran Castle. For the first time Bran Castle was used in 1378 to protect against attacks by the Ottoman Turks and later became a customs post between Transylvania and Wallachia. From 1920 Bran is one of the residences of the Romanian king. It became home to Queen Mary and is decorated with artifacts mainly of this time, including traditional furniture and tapestries, collected from her. Her daughter - Princess Ileana inherited it but the communist regime in Romania had it confiscated after deportation of the royal family in 1948. In 2005 the Romanian government voted a law through which allows restitution of such properties as Bran Castle. In 2006, Bran is owned by Dominic of Austria, Prince of Tuscany, known as Dominic von Habsburg, an architect in the state of New York and son of Princess Ileana. Today Bran castle is a museum open to visitors who can see art objects and furniture collected by Queen Mary. At the foot of the hill on which is built Bran, a small museum complex, presenting a traditional Romanian rural life and home is also operational.